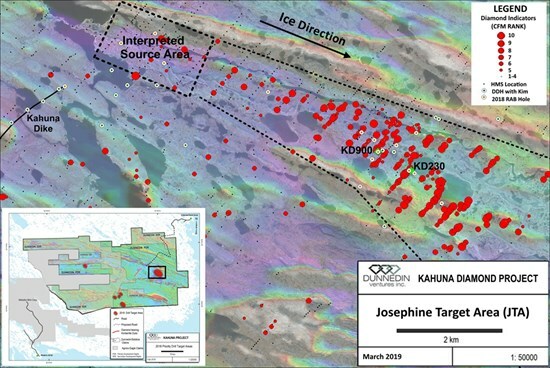 Vancouver, British Columbia–(Newsfile Corp. – March 20, 2019) – Dunnedin Ventures Inc. (TSXV: DVI) (the “Company” or “Dunnedin”) today announced results from 109 till samples collected in the Josephine Target Area (JTA) during the fall of 2018. Results have defined a discrete target area for potential diamond sources of 3 km2 at the head of the JTA, a trend of abundant high-quality diamond indicator minerals (DIM) for which no source is known yet. Although the focus of Dunnedin’s near-term exploration plans will be on its recently expanded portfolio of large-scale copper porphyry projects in Canada and the USA (see news releases of November 29, 2018 and March 4, 2019), the Company’s next diamond-focused exploration campaign will be aimed at the discovery of kimberlite pipes within this newly defined area. Till samples collected on the Kahuna property are shipped to the CF Mineral Research Ltd. (“CFM”) laboratory in Kelowna, BC for processing and analysis. Using a scanning electron microprobe (“SEM”), CFM employs proprietary mineral chemistry filters and classification criteria to determine diamond indicator minerals (“DIM”), which distinguish indicator minerals that formed with diamonds from those just associated with kimberlite host rocks (“KIM”). Sample sites are subsequently ranked from 1 (low priority) to 10 (high priority) based on both the quantity and quality of DIMs and quantity of KIMs in each sample. CFM operates using reference standards, internal quality assurance protocols, security and operating procedures for processing, recovery and reporting of results. The CFM laboratory is accredited and audited for international quality standards through the International Organization for Standardization/International Electrotechnical Commission (ISO/IEC) 17025:2005, which includes ISO 9001:2015 specifications. Jeff Ward, P.Geo, Vice President Exploration and a Qualified Person under National Instrument 43-101, has reviewed and approved the technical information contained in this release. For further information please contact Mr. Knox Henderson, Investor Relations, at 604-551-2360 or [email protected]. Dunnedin Ventures Inc. (TSXV: DVI) is advancing its 100% owned Kahuna Diamond Project in Nunavut, and copper porphyry projects in British Columbia and Arizona, USA. The Kahuna Project hosts a high-grade, near surface inferred diamond resource and numerous kimberlite targets. The Company is working with its advisor and largest shareholder Dr. Chuck Fipke to define and prioritize drill targets based on an extensive historic data set, and diamonds and indicator minerals recovered from a series of kimberlite and till samples collected by Dunnedin over four seasons of field work. Dunnedin also holds 100% interests in the Trapper Porphyry Project in the northern Golden Triangle region of British Columbia, and the MPD Project in south-central British Columbia near Princeton. The Trapper and MPD Projects are interpreted to overlie gold-rich copper porphyry systems having surface geochemical, geophysical and regional alteration signatures of considerable size. In March 2019, Dunnedin entered into a letter of intent to acquire 100% of the Mohave copper-molybdenum-silver porphyry project in Yavapai County, Arizona, USA. Based in Vancouver, Dunnedin is part of the Discovery Group of companies led by John Robins, a mining entrepreneur who founded and chaired of Kaminak Gold which Goldcorp acquired for $520 million . Dunnedin’s management team has significant capital market strength and is backed by an experienced team of exploration experts with a track record of discovery. Statements included in this announcement, including statements concerning our plans, intentions and expectations, which are not historical in nature are intended to be, and are hereby identified as, “forward-looking statements”. Forward-looking statements may be identified by words including “anticipates”, “believes”, “intends”, “estimates”, “expects” and similar expressions. The Company cautions readers that forward-looking statements, including without limitation those relating to the Company’s future operations and business prospects, are subject to certain risks and uncertainties that could cause actual results to differ materially from those indicated in the forward-looking statements. Accordingly, readers should not place undue reliance on forward-looking statements. Forward-looking statements contained herein are made as of the date of this news release and the Company disclaims any obligation to update any forward-looking statements, except as required by applicable securities laws. Disclaimer: This is an unedited and minimally reviewed public mining company press release originally published at http://www.newsfilecorp.com/release/43508/Dunnedin-Defines-Potential-Diamond-Source-Target-Area-at-Kahuna-Project-Nunavut. We have linked to our knowledge base articles from within the content of this release in order to help explain some of the terminology used and provide continuity from previous and related news coverage. You can access more in-depth mining company project reviews on our site, as well a knowledge base of articles on mineral exploration, mining and geology-related topics.